The Parchman Hour: Songs and Stories of the '61 Freedom Riders is performed on the Guthrie's McGuire proscenium stage through November 6. 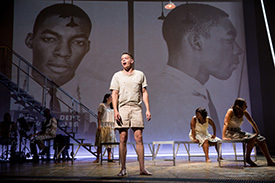 A play with music, The Parchman Hour tells the story of the young women and men who rode buses headed for the Deep South to call attention to illegal segregation. You may wonder, if this show is about the Freedom Riders, why is it called The Parchman Hour? 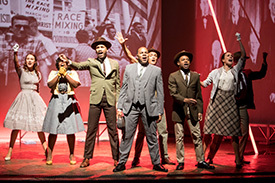 "Arrested and imprisoned in Mississippi’s notorious Parchman Farm Penitentiary, these Freedom Riders endured by creating a nightly variety show called “The Parchman Hour.” The Parchman Hour is a captivating play with music, one that reveals a defining chapter in American history while celebrating the hope and resilience of a community that joined together to stand against segregation." This play was originally staged in 2010 as a student production at Duke University, and had its world premiere in 2011 at Playmakers Repertory Theater in North Carolina (with producing artistic director Joe Haj.) Mike Wiley, the playwright, specializes in documentary theater and according to the Playmakers website: "The student production was also featured in workshop in May 2010 as the finale event of the Freedom Riders’ 50th anniversary commemoration in Jackson, Mississippi." The play features twelve actors, who are listed as both an actor number and a character name (e.g. Actor 1 - Forsyth/Stephen Green). 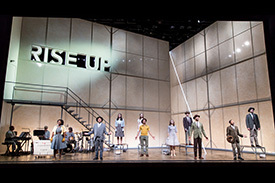 The spare, white stage of the McGuire Proscenium stage features occasional projections of archival footage and mug shots of the Freedom Riders as each actor steps forward as a Rider and tells us about their experience. The story of the Freedom Riders is an incredibly compelling chapter in Civil Rights history. If you've not seen PBS's American Experience: Freedom Riders, I highly recommend doing so. Also, WGBH's website has a host of fascinating information about the rides and riders, including full Freedom Riders rosters, an interactive map, a timeline, and biographies of the Riders. Also, please read John Lewis's graphic memoir March (volumes 1, 2 and 3, co-written by Andrew Aydin, art by Nate Powell) for a fantastic, compelling look at the movement and the Rides. I warn you, be sure you have all three volumes before starting, because number two ends with a hell of a cliffhanger. To be sure, the music in The Parchman Hour is wonderful. With a marvelous on-stage band led by Sanford Moore, the chorus numbers are beautifully sung by the great cast. A few cast members really stood out, especially Kory LaQuess Pullam (as Stokely Carmichael), who I've recently seen in non-singing roles. It was a treat to hear his gorgeous voice again. 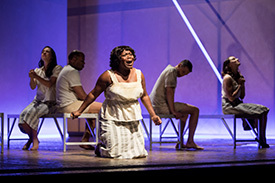 Zonya Love, as Pearl, and the sole woman of color in the 12-actor cast, had a beautiful voice and great stage presence. Other outstanding performance included those of Kevin R. Free as James Farmer and Jared Joseph as John Lewis. Zonya Love tearing down the roof. Yet I didn't love this show, and I feel pretty conflicted about it. The Parchman Hour doesn't feel complete to me. It covers such a specific aspect of the Freedom Rides, and one that allows for light-hearted goofing and singing, which is combined discordantly with vivid depictions of body cavity searches and beatings. The end of the show, instead of following up on the Riders, their stories, and what they accomplished, is devoted to a reading of the names of contemporary victims of police brutality. Which is important, but felt tacked on at best. The reading of names was followed by a rousing song with exhortations to clap along to end the show. It's hard not to feel that the ending was engineered to make the audience feel pretty good about themselves. My sister and theater companion, who is not generally cynical, turned to me after the show and said, "Isn't it great that we solved racism?" Also, did I mention that Zonya Love is the only actress of color in the cast? And repeatedly, she is placed in the back, off to the side and barely spotlit while the three (three!) white actresses get multiple opportunities to shine. It was really hard to see that kind of disparity, particularly in a show about civil rights. I mean, come on. The Parchman Hour tells about an important time in our country's history and brings some aspects of it to life, but overall, it felt like a good idea that never really fulfilled its promise.